Prestigious Gated Deep Run community! 4 Beds 3 / 2 Baths 2 Partial Baths 4,167 Sq. ft. 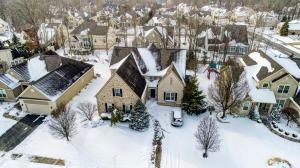 Description: Open saturday, 1/26, 1-3! Immaculately cared for in prestigious, gated deep run community off orange rd. In powell. Truberry built quality details start with the custom paver driveway in front and trex deck in back. The 1st flr features an open floor plan with a gourmet kitchen opening to the 2-story great room with a wall of windows and stone fireplace. Stainless steel appliances, granite counters and hardwood floors in kitchen/eating area. Vaulted 1st flr master bedroom overlooks deck and includes large whirlpool tub & walk-in closet. 3 bedrooms upstairs, including two with ensuite bathrooms. Huge 4th bedroom/office with a wall of built-in bookcases. Full basement w/kitchen with microwave, dishwasher and beverage coolers, plus space for a rec area and pool table. Back up generator.